Our sincere thanks, a public shoutout on Facebook or Twitter, and your name listed on our backer webpage! Receive the above perks PLUS membership to an exclusive Facebook group! Have special monthly access to never before seen content, art, posters, clips, bloopers, and interviews. Status: Content downloadable from Fan Club. This also provides a forum for more intimate fan interaction for us so we can find out what you all want as a community! Status: Use our Facebook Page to discuss New Voyages. Download a DVD ISO of "World Enough and Time" that includes cast auditions and other bonus material! Get to download a digital copy of the "Mind-Sifter Illustrated" script, PLUS, receive the above perks PLUS membership to an exclusive Facebook group! Have special monthly access to never before seen content, art, posters, clips, bloopers, and interviews. This also provides a forum for more intimate fan interaction for us so we can find out what you all want as a community! Status: Content available in fan-area. DIGITAL DOWNLOAD of High resolution render of The U.S.S. ENTERPRISE by our own VFX Genius, Tobias Richter. Suitable for printing in large format and framing! Note: this is not the same image being offered as a custom print, it is a different but beautiful image! Status: Image available in fan-area. Get to download a digital copy of the "Torment of Destiny Illustrated" script, PLUS, receive the above digital perks PLUS membership to an exclusive Facebook group! Have special monthly access to never before seen content, art, posters, clips, bloopers, and interviews. This also provides a forum for more intimate fan interaction for us so we can find out what you all want as a community! Status: Cannot be fulfilled before the episode has been released. An Original Star Fleet U.S.S. Enterprise insignia made from the actual embroidery templates given directly to James Cawley by Original Series Costume Designer William Ware Theiss! Choose from Command,Science, or Engineering ! These are the most accurate reproductions ever made and are of the 1st/2nd season variety. Note: This is a stand alone perk! Status: These patches have been shipped. Receive the above perks PLUS a download of our next completed episode with an exclusive blooper reel or interview with a cast member. Status: To be fulfilled when Torment of Destiny can be released. Get a DVD of "World Enough and Time" that includes cast auditions and other bonus material! Status: Available for download in the fan-area. Receive the above perks PLUS a digital treasure trove of behind the scenes footage, interviews with cast, set photos, and more! Status: Much of this already available with more to be released in coming months in fan-area. Receive the above perks loaded onto a USB pen drive, emblazoned with an exclusive version of the STNV/PII logo. Get a FULL SIZED *copy* of one of the *actual* 1966 Desilu set plans from James Cawley's personal collection! This is NOT an internet copy or fan remake. This is a copy from the original 49 year old set plans!!! A New Voyages/Phase II Logo t-shirt (your choice of size and color), and digital downloads: Torment of Destiny and Mind-Sifter Illustrated scripts, and digital download of A Tobias Richter render of the Enterprise. Status: Mind-Sifter Illustrated Script and Enterprise Image available in fan-area. Receive the above perks loaded onto the custom USB drive with special STNV/PII Logo PLUS a digital illustrated script. Chock full of photos and details on the cast and characters, this reads like a "Making of" book with even more behind the scenes info and images. Status: USB Drive pending. Illustrated Script downloadable in fan area. Digital DVD ISO files of the first 9 episodes! Download each ISO and burn your own DVDs! Cover art is included for you to print your own DVD case art! Status: DVD ISO files available for all episodes in fan area. A Stunning 24 X 36 Gallery print of The U.S.S. 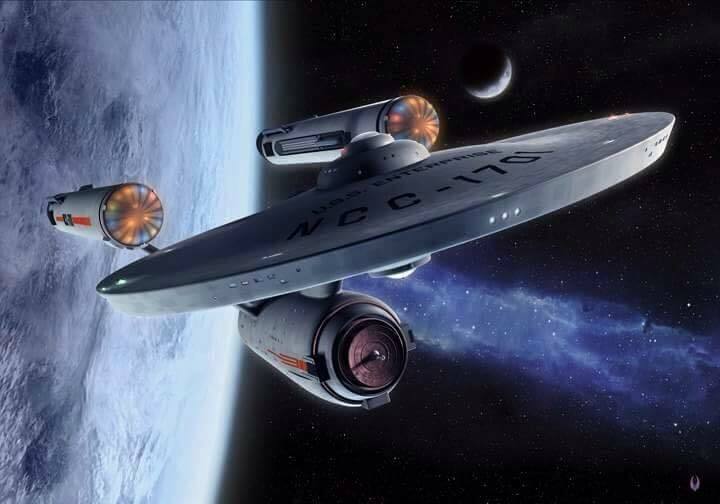 ENTERPRISE suitable for framing created by our own Tobias Richter​, VFX Genius Extraordinaire! This is limited to only 12 world wide, and is a stand alone perk. Status: Prints shipped. Image downloadable in fan area. Receive the above perks loaded onto the custom USB drive with special STNV/PII Logo signed by the cast PLUS all the LCARS animation graphics that run on the engineering section of the bridge set. (Compatible with PC only not Mac), no additional software needed. Turn your computer into the Bridge of the Enterprise with these graphic files. Download all the digital perks above, plus, receive some special Star Trek New Voyages/PhaseII swag only offered to crew previously. These include, Tshirt, KeyChain, sports water bottle, and your very own special wallet sized, plastic Thank You Credential, personalized with your name and a special piece of Star Trek New Voyages artwork! Status: Pending. DVD images can be downloaded from our fan-area. “Boxed set” of DVDs of all episodes and signed by the cast! Also, you get to download all the digital perks above!!! Status: Pending. DVD images and digital perks can be downloaded from our fan-area. “Boxed set” of Blu-rays of all episodes and signed by the cast! Also, you get to download all the digital perks above!!! Get all of the digital perks above, plus all of the physical perks in the $350 and $400 levels, PLUS get a printed illustrated script! This will be a high quality, bound book that will be a collectors dream. Set Tour! Receive all of the perks up to $ 100, PLUS you get a personal tour of the Star Trek: Phase II sets by James Cawley as well as lunch with James and the team (Travel and accommodations not included). You will get a "Special Thanks" credit in the credits for our next episode "Torment of Destiny" and your own copy of the script signed by writer Rick Chambers and Show Runner David Gerrold. The "Torment of Destiny shoot is July 11-24th, and you may take your tour at this time, or any other time when we are not shooting (It is WAY more fun when we are shooting! ).